Nuby Keepeez Review: Keep Those Germs Away! Now that Giovanni is 9 months old, we have officially hit the “fetch” stage. If you have young children you know what I’m talking about… its when your baby treats you like the family dog playing “fetch” with their sippy cups (or basically anything on their high chair). They think its hilarious to watch you bend over 20 times during dinner to pick their cup up, walk to the kitchen sink to rinse the spout and give it back to them just to start all over again. But seriously, Nuby has come up with something better than an app. I’d like to introduce you all the to Nuby Keepeez Adjustable Bottle/Cup Strap! The Nuby Keepeez Adjustable Strap is Heaven sent! One end is made to snap to your child’s highchair, stroller, carseat – basically anywhere you can think of – while the other end keeps cups tightly fastened with an adjustable push button locking mechanism. We recently took the kids on vacation and I took the Keepeez along for the ride. I wanted to make sure I put it to good use before this review and I have to say I absolutely love it! When I have a cup strapped to this baby it doesn’t touch the floor once and stays germ free. It also saves me from our game of fetch! Can you believe it even strapped to my Ergo Baby Carrier? It was hilarious to watch Gio take sips from his cup and then drop it down by my side. So far, I have yet to find a place where the Nuby Keepeez does not come in handy. 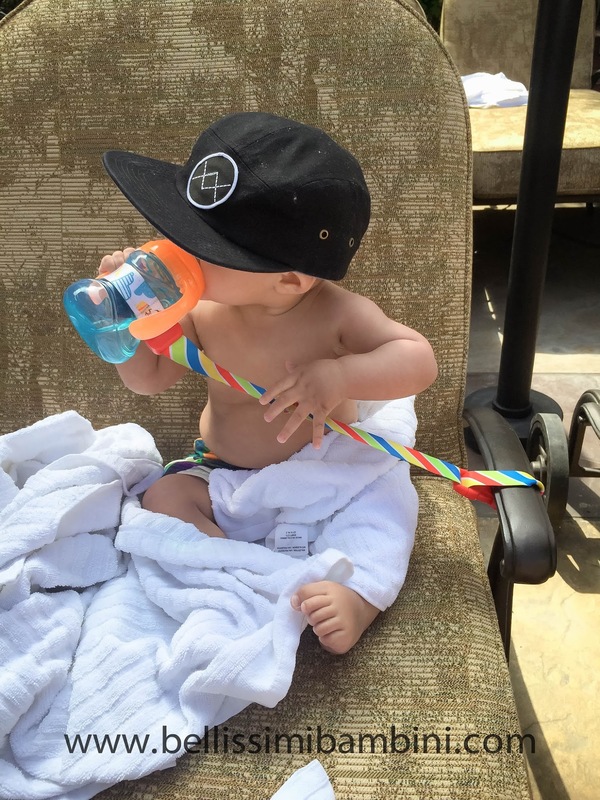 It works everywhere from the highchair to the stroller and even to our poolside lounge chair! You must all be wondering the same thing now.. where can you find a Keepeez for your little babe? Nuby’s Keepeez Adjustable Cup Strap is now available in 3 fun colors and prints at Amazon.com. I have included the direct link for you here. Want to try your chances at WINNING a Keepeez for your little one? Make sure you are following me on Instagram where you will get your chance later today! I’d love to hear back from my readers! If you have a moment to say hi, leave me a comment below letting me know what you would strap your Keepeez to to help keep your child’s cups germ free. I received the above mentioned item courtesy of Nuby. As always all thoughts and opinions are 100% my own. I would strap it to everything!!! Haha In all seriousness the first place that comes to mind is the jogging stroller. She messed up my workout flow last week when I had to stop my run and pull her stroller over to go FETCH her sippy cup! This is genius!! I knew instantly what you were talking about when you mentioned the "fetch" stage, because I know it all too well. And have lost many a wubbanub because I didn't realize we were playing that game till long after we were home. I would strap it to anything and everything!! 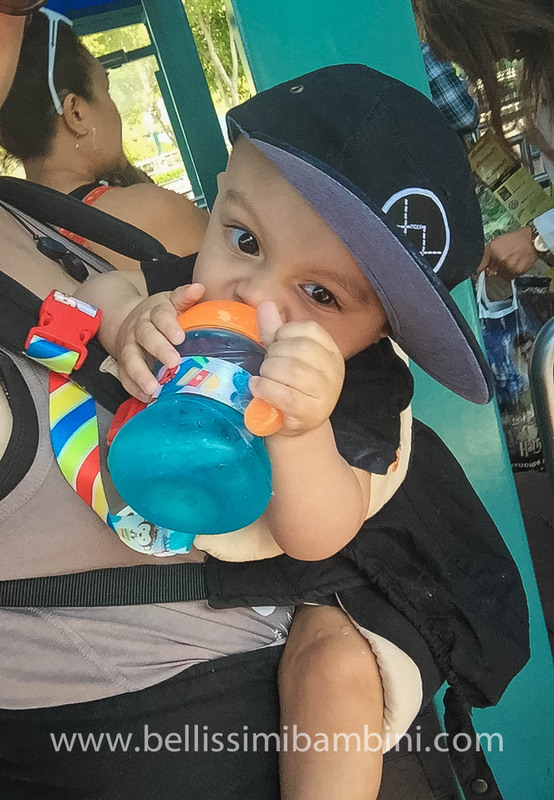 But I think the place it would get the most use is his high chair…and then his car seat, and then his stroller!! I love this! I have heard great things about these, but you proved they are amazing! I love all the ways that you have utilized the strap, how great! Such an awesome way to keep the bottle near and avoid messes. This is genius! At 24 months my son still throws his cups! I would strap it to his exersaucer and high chair. He's only 6 months and drops his sippie cup and the dog really loves to play keep away. This would be PERFECT for my little man! He has officially entered the "fetch" stage, and I can't say I'm the biggest fan lol. That is such a smart idea! My daughter is two so she is good with hanging on to things now, but the next kid is getting one of these!